It has certainly been a long time coming, however Real Time Gaming have final designed and launched a new slot game on which you will find a 243 ways to win playing structure! That new slot is the Eternal Love slot which has been getting some rave reviews from players. There is one thing to bear in mind when you to play any 243 ways to win slot game online and that is to have all of those possible ways to win in live play you do need to wager a set number of coins per spin. Real Time Gaming has made playing all of those ways to win as affordable as possible for you can wager as little as just 30 coins to have them in live play. You will also find you can increase the coins you wager per spin in increments of 30 coins and will also be able to play it for a range of different coin value settings too, so low and high stake payers will find it very appealing. Read on for an overview of the best part of this slot which is its unique bonus feature round that you will find described below. The one thing that did stand out when we played the Eternal Love slot game is that the bonus game it has on offer can, with some luck in playing, award you with a very large amount of cash, and as such it is a bonus game that you will want to see triggering as often as you possibly can do. In fact, the way that it is designed to trigger is fairly straight forward for all that you will need to spin in is at least three of the scatter symbol anywhere in view. Once triggered you are then going to be playing off 10 free spins, those free spins do obviously play off with the 243 ways to win playing structure and format in live play and with the same stake amounts you wagered on the base game triggering spin. There is a hidden life force meter in play as the free spins are all playing off and as soon as you have played off your final free spin that life force meter will then be revealed and it is going to award you with a bonus payout worth between x3 or as much as x100 of the stake amount you had in play on the triggering spin! 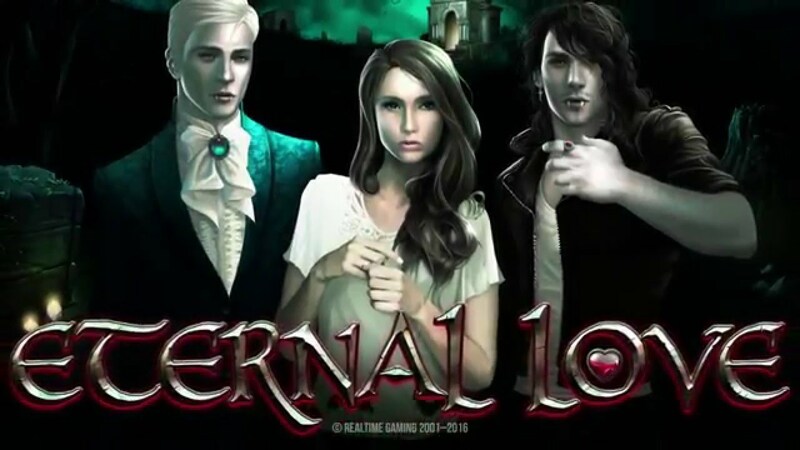 When you first see the Eternal Love slot game from Real Time Gaming you all think it is simply a clone of Microgaming’s Immortal Romance slot, however there are many differences between those two slots so RTG have simply not copied that popular Microgaming slot game structure and playing format! However, please keep in mind at all times when you are playing this slot that it does come with the All Pays playing format and structure which is quite new for Real Time Gaming, for they have previously only concentrated their effort on designing fixed and optional payline slots. That playing structure does force you to have to play a set number of coins on each spin you play off and that will mean you do need to set the coin values according to your available bankroll, so make sure that is something you do before clicking onto the spin button! If you play for too high a coin value setting and put into play too high a coin increment then you could find this slot can eat up your bankroll very quickly!